While shopping at Wegman's a few weeks ago, I picked up a box of pasta shells just on a whim. I didn't have any recipes in mind, but thought that maybe I'd make them soon. That weekend, I decided to make stuffed shells, but wanted something different and with a creamy sauce instead of a red sauce. I also wanted to incorporate chicken, as well as 2 cans of artichokes I came across while reorganizing my pantry. Mmm, artichokes got me thinking about my favorite hot dip recipe, Spinach Artichoke Dip. And there it was - my inspiration for these Chicken Spinach Artichoke Stuffed Shells! These shells took a little bit of work, but if you poach or bake and chop your chicken beforehand (even the day before), you will save some time. There isn't anything hard about this recipe, it just requires some prep which means a lot of dishes to wash! My parents and my friend Jenny came over to eat these, and we all loved them! They tasted so much like my Spinach Artichoke Dip which is exactly what I wanted. I will definitely be making these again! The amounts are approximate as I created this recipe as I cooked. I go based on look, feel, and taste, adding as necessary instead of adding all of my ingredients at once. Place the chicken in a pot with all of the spices/herbs, cover with water and cook on medium until cooked through. Remove from water and chop or shred. The bechamel: Heat butter in a pot over medium high heat. Add flour and whisk until you have a nice roux. Add the cream and bring to a simmer. Remove from the heat and add the cheese, whisking until creamy. Season as needed with pepper (it should be salty enough from the cheese). Heat olive oil in a large saute pan over medium high heat. Add the onion and garlic (and red pepper flakes, if using), saute 2-3 minutes. Transfer the onion and garlic to a large mixing bowl. Add the chicken, mozzarella, artichokes, and spinach, and then slowly add your ricotta and 1/2 c of the bechamel until you have a nice thick mixture. 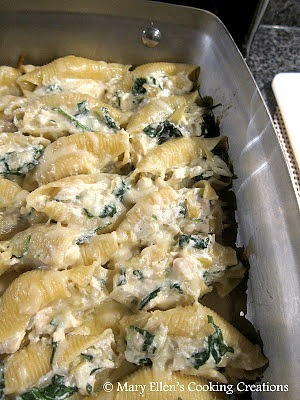 You don't want the cheese to overtake the chicken, so make sure your ratio of creamy cheesy goodness to chicken works. Cover the bottom of a baking dish with a layer of the bechamel. Stuff each shell with a large spoon full of the chicken mixture and place in the dish. 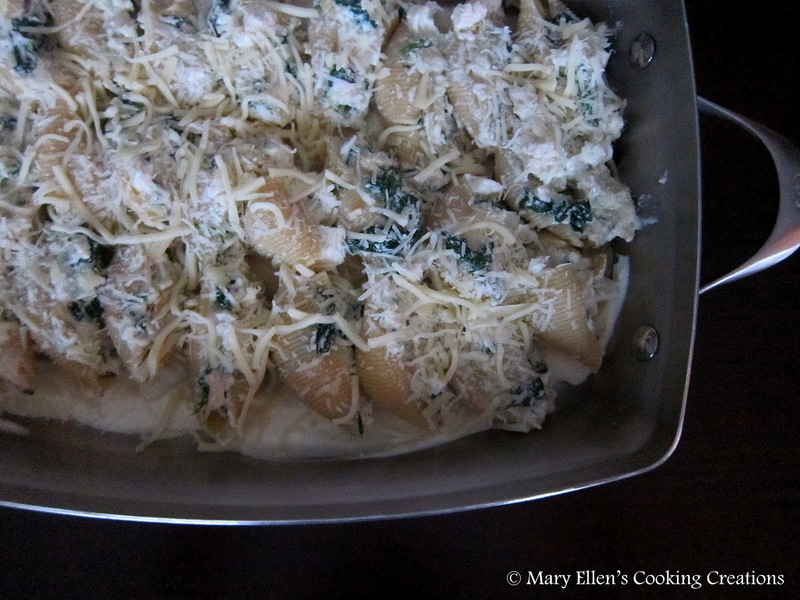 Once you have filled the dish, top the shells with a bit more mozzarella and Parmesan cheese. Bake on 400 for approximately 20-25 minutes, or until hot and bubbly. Too funny, I was just looking up Spinach Artichoke pasta based recipes yesterday! This looks delicious! OMG! I made these tonight and they were out of this world!! They're definitely going on my list of meals to freeze before I have my second baby this spring.